“After almost 64 years on Grand Avenue in downtown Los Angeles, the Caravan Book Store is moving on to new adventures. The dynamic nature of the store is an experience I’ve loved, and I’ve enjoyed sharing it with so many people. It has been a family tradition for three generations. Described by the L.A. Times in 2016 as a “raft in a downtown awash in rising rents and fast entertainment…a refuge where pages matter more than page views, Gutenberg more than Google,” Caravan had continued to specialize in books “old and new, curious and rare,” as signage indicates, particularly about California, the West, and early L.A., as it did when Bernstein’s parents opened up shop in the space across the street from Caravan’s current location. Although the physical location is closing, Bernstein said in his email that “business will continue,” and encouraged people to reach out via email or “good old-fashioned U.S. mail” at his new post office box beginning March 1: Caravan Book Store, P.O. Box 550, 7162 Beverly Blvd., Los Angeles, 90036. Caravan Book Store closing sale, 550 S. Grand Ave., downtown; Feb. 3-24, Mon.-Sat., 11 a.m.-6 p.m. and by appointment. 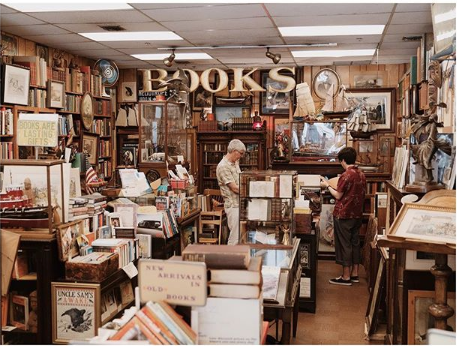 RELATED: The 14 Best Mom and Pop Bookstore in L.A.